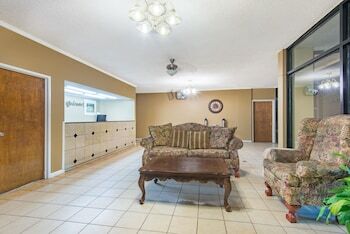 Located in Clanton, Days Inn by Wyndham Clanton AL is a 2-minute drive from Peach Park and 6 minutes from Clanton Golf and Country Club. Featured amenities include complimentary newspapers in the lobby, a 24-hour front desk, and a safe deposit box at the front desk. Free self parking is available onsite. Located in Clanton, Key West Inn Clanton is a 3-minute drive from Peach Park and 7 minutes from Clanton Golf and Country Club. Free self parking is available onsite. Located in Clanton, Best Western Inn is a 1-minute drive from Peach Park and 7 minutes from Clanton Golf and Country Club. Free self parking is available onsite.